"And the man gave names to [all the animals] . . ."
The gulches have no names. Not real names. Nor do the lakes. That became clear during our August backpack. 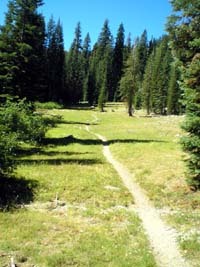 Consider the maps of the Trinity Alps Wilderness published in 1984 and again in 2004 by the United States Department of Agriculture, Forest Service. What's wrong with these two maps? (Click on each to enlarge.) 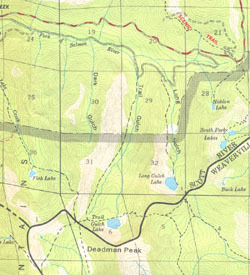 The 1984 map (left) places Trail Gulch and its namesake lake to the west of Long Gulch and its lake. 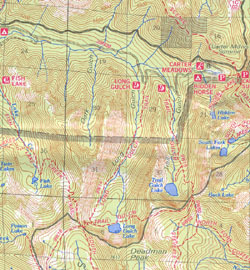 The 2004 map (right) reverses the positions of the two gulches and their lakes. Twenty years separate the maps, and in that time the Forest Service managed to wrangle Long Gulch from the east to the west of Trail Gulch. A remarkable accomplishment. And people say the government does nothing! Back in September of 1988, Barbara and I, following descriptions in guide books and the Forest Service map then current, hiked into Trail Gulch Lake. The lake on the west. We were accompanied by Mr. Popper and two other couples. The hike was singularly unmemorable, though we have notes and a dozen glossy photos to prove it happened. The notes tell us that the weather had been very hot, algae clogged the lukewarm lake water, and we dayhiked over to aptly-named Poison Lake. But neither Barbara nor I have any recollection of it, except perhaps a vague disquiet about leaving the group on the final day to climb over the ridge and out through Long Canyon. The canyon to the east. Did our subconscious block it all out, I have wondered, or were those remembrances erased when the Forest Service changed the maps? In any event, we decided to go back. A hike of three-and-a-half miles and an altitude gain of a thousand feet seemed within the capabilities of elder trekkers. Under the circumstances, however, "back" was a tricky concept. In our minds, we were returning to Trail Gulch Lake. But for the sake of clarity, I will hereafter use the 2004 Forest Service designations, in which case we were returning to Long Gulch Lake. We took Highway 3 over the Scott Mountain Summit and at Callahan caught the Callahan-Cecilville Road, Forest Road 93, west. Just past Carter Summit, at Carter Meadow, Forest Road 39N08 forks left to meander south into the foothills paralleling the Callahan-Cecilville Road for a half-dozen miles before rejoining it at the Trail Creek Campground further west and twelve-hundred feet lower. Actually, we missed the Carter Meadow turnoff and had to backtrack on 39N08 from the Trail Creek Campground to scout the area. A couple of miles east on 39N08 an unsigned wide spot in the road marked the Long Gulch (formerly Trail Gulch) trailhead (N 41 12' 59.4", W 122 55' 44.3", 5266 feet). Below it a stub road dropped two-hundred feet through the woods to the creek and a hunter's camp boasting several fire rings. The trail itself climbed from the road through an open metal stock gate. 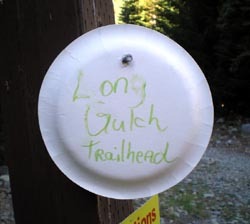 On a wooden post displaying a "Campfires Prohibited" sign some thoughtful soul had pinned a small paper plate scrawled with "Long Gulch Trailhead." I verified the trailhead with my GPS, which I had programmed from not-always-reliable DeLorme maps. Two vehicles were parked beside the road. By contrast, three-quarters of a mile further east on Road 39N08, around a steep, rocky roundhouse curve, the Forest Service had erected proud new monuments and a sign marking the Trail Gulch Trailhead (formerly Long Gulch). A vicinity blowup copied from the 2004 map glistened beneath its plexiglass shield. Here was space to park a dozen cars and, in the trees, a small, rustic camping area without water or toilets. We counted a dozen vehicles at that trailhead. The Forest Service obviously preferred that hikers and equestrians enter the wilderness there. They didn't say why. Continuing east on Road 39N08, we came to the Hidden Horse Campground on the southern margin of Carter Meadow. It offered running water and pit toilets, and each campsite had its own sturdy new corral build of peeled posts and rough-sawn planks. Scattered hay, manure, horse flies, and a ripe equestrian aroma garnished the landscape, but only two campers were there, one at each end. The horsey folks obviously held sway at Carter Meadow, but that didn't mean they could stand to camp beside each other. We spent a pleasant night camping in the van at the empty Trail Creek Campground. At five in the morning we arose, just as a dim gloaming began to reconstruct the ghostly world, ate breakfast, and stuffed our backpacks with all the essentials for a four-day outing. Then we drove the two miles to the unmarked Long Gulch trailhead and parked the van next to the only other vehicle there. We were on the trail by nine. The weather was clear and still cool in the shade, but forecast to become hot. We climbed through thick forest on a trail rocky in places, but well-maintained, and after a mile crossed the shallow waters of Long Gulch Creek to hike in open Douglas-fir forest along the base of the steep western wall. Above us rose a cliff crowned with granite spires. A series of grassy meadows and alder thickets filled the valley floor to our left, all tilting downward from Deadman Peak, which we glimpsed from time to time through the trees. Just below the junction with the Fish Lake route we stopped for a break just as five young men came bounding down the trail. They had spent four days fishing at Long Gulch Lake and recommended their excellent campsite on the north shore, now vacant and awaiting us. The only other person at the lake when they left had been a wilderness ranger. Closer to the junction we encountered a young couple with two dogs, who had hiked through from Trail Gulch and stayed at Long Gulch Lake the previous night, apparently undetected by the five young fishermen ahead of them. At the trail junction (N 41 10' 59.5", W 122 56' 37.6", 6440 feet) a hatchet-marred sign pointed left to Long Gulch Lake and right, up the steepening trail, to Fish Lake over the crest. We headed left into an open forest and through a valley of giant white granite boulders, with the stark cliffs of Deadman Peak looming just ahead. It was stunningly wild country. Before long the alpine lake appeared. We continued past a small campsite at the northwest corner. Though it was forested and shady, it seemed too far from the water. We continued along the north shore eastward until we encountered a ranger, who stood watching us approach from a large campsite overlooking the lake. "Howdy," I called out. "You probably want to see our backpacking permit." "Not really," he said, approaching us. He was trim and fit, with a short, neatly groomed beard and a dusting of gray at his temples. We stopped beside him. "I've got it in my pack," I said, "but it's hard to get to." 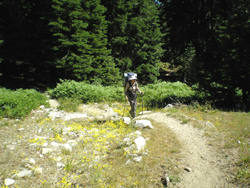 "This northern sliver of the Trinity Alps is in the Klamath National Forest," he explained. "Here, if you say you've got a permit, I trust that you have one, and even if you don't, I would just write one up for you." "You must be the ranger we heard about," I said. "Not at all. 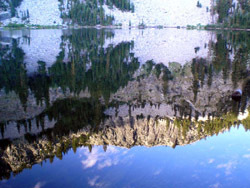 Now, is this Long Gulch Lake or Trail Gulch Lake?" I asked. "The maps don't seem to agree." "I've only been a wilderness ranger for about five years," he said, "so I wasn't around when that first map was drawn up. But I do know the names have been changed." He evaluated us for a moment, then added without breaking a smile, "I reckon the Forest Service dragged Long Gulch over here and shoved Trail Gulch back over there." He pointed east. Right then I knew I liked him. He was more a Big Ranger than a petty little one. I stuck out my hand. "I'm Rick and this's Barbara." "And I'm Rex." He shook my hand. "How come they put up a big trailhead sign only at the other gulch?" I asked. This, he told us, was to encourage hikers to circle clockwise between the two gulches, because the climb down into this west gulch is steeper than the climb up out of the east gulch. Clockwise was perceived to make for an easier hike. "You probably know this lake pretty good," I said. "What do you think is the best campsite? We plan to be here three nights." He didn't answer directly. "Take a look at this one," he said. "I just finished cleaning up here." We followed him over and helped each other off with our backpacks. It was a splendid campsite (N 41 11' 00.8", W 122 56' 11.1", 6425 feet). He had dug out the ash from the fire pit and spread in the bushes. "And there's another good one back up the trail," he added. He led me there while Barbara waited with our backpacks. We chatted as I followed him briskly along the trail. I felt as light as a butterfly, hiking without a backpack. I asked whether showing us around was part of his job, or if he was on his lunch break. He laughed. "Part of the job," he said, obviously in love with his work. For him it was a second career, having already retired from his first. "I come out here into the wilderness, sometimes for days at a time and often all by myself, and they pay me for it. Imagine!" The other campsite turned out to be the one we had passed coming in. It was small and neat, but a thick wall of alders cut off any view of the lake and the surrounding cliffs. I asked about horse camps, and he said there was one below the campsite where Barbara waited, and another above the big meadow at the east end of the lake, but he didn't recommend them. "Why not? Cause of the horses?" "Cause of what the horses leave behind." Back at the first campsite we continued our palaver, until two women arrived on horseback and stopped beside the trail. They were middle-aged and dressed in riding outfits. They waited until Ranger Rex excused himself and strolled over to chat with them. After a long conversation, Rex returned and stuffed his simple gear into a backpack and bid us farewell. Rex seemed to be the complete package, a tad hermit, yet still a people person. As much as he enjoyed his solitude, he also enjoyed company. An unusual combination, I told him as he was leaving, and he replied, "I like to talk with folks about the wilderness and the trails and the things that fascinate me. But that's about it." The campsite was perfect. It overlooked the lake and provided great views of the craggy, steep walls of the granitic cirque. Access to the water was easy. A tall forest of red and white fir, western white pine, and hemlock provided shade and a few good hammock trees. 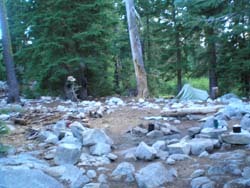 The fire pit was clean, and a level tent site had been cleared on the otherwise rocky ground. We had climbed nearly twelve hundred feet in three-and-a-half miles to reach the lake elevation of 6400'. As we unpacked our tent and food bags and cooking gear, loud chattering persisted through the trees bordering our camp. Investigating, I discovered that a hundred feet below our campsite the trail dropped through a narrow horse camp. Manure had been generously trampled into the soil beneath the conifers. Beyond the horse flies, the woods opened onto a grassy, green swath of meadow through which the outlet stream from the lake meandered. Both the camp and the meadow were screened from our view by an impenetrable thicket of red alders. Alders and willows also cut off any view of the lake from the little meadow. The two women who had ridden in earlier were taking a break beside their horses, conversing intently. "Hi," I said amiably. "Do you call this Long Gulch or Trail Gulch Lake?" "Oh, this's always been Long Gulch," one of them responded indignantly. "The folks in the Scott Valley have always known that. Some Forest Service cartographer messed it all up on the map in the 80s. But it's Long Gulch Lake. Always has been." "So you're from the Scott Valley?" "Sure am," she replied, turning back to her friend and dismissing me. While we were eating lunch three young adults, two children, and a dog passed by. 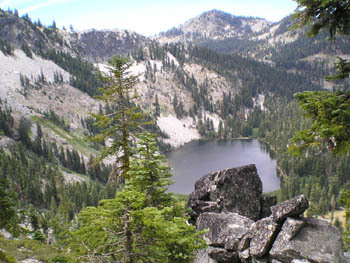 They had hiked over from Trail Gulch Lake, where they had been camping. We told them about the campsite on the west end of the lake that Ranger Rex had showed me, and they hurried over to take it. 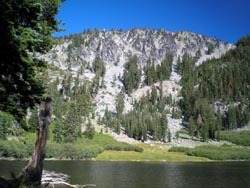 Then two couples came in from the Long Gulch Trailhead and found the horse camp up in the trees above the big meadow at the east end of the lake. They would have a long walk down to the lake for water. We considered ourselves fortunate to have arrived a little bit earlier than all the others, because the primo site was ours. That evening was quiet and peaceful. Watching the fish jump in the twilight, we barely heard the other campers. We slept well that night as the temperature dropped to around 50 degrees. Wednesday we awoke late, but well rested, and spent the morning gazing out over the serene lake and its mirrored reflections of the towering cliffs and surrounding headwall. 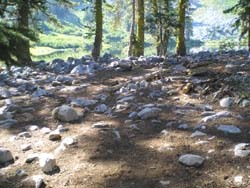 Our campsite straddled a terminal moraine, with plenty of rounded granite boulders sprouting among small firs, alder, and willows. Azaleas grew by the shore, but were no longer in bloom. I finally managed to relocate both hammocks in a new and shady site with fine views of the lake. In the meadow Barbara found Wilson's warblers, red breasted nuthatches, and tiger lilies. The few clouds were gone by mid-morning, and the weather grew warm and sunny. Late in the morning we hiked to the big meadow at the east end of the lake and across steep, rough terrain to the island beneath the headwall, thinking we might go for a swim. But it was too brushy and afforded no access to the water and no shade. The hillside there was covered with tall delphiniums. We stopped and ate lunch at an old campsite above the meadow. "RESPECT FOR SOLITUDE. The true wilderness enthusiast comes in search of quiet and serenity. Respect your solitude and that of others by leaving sufficient space between camps, and by leaving radios and boisterous conduct at home." Strangely, that quote was not reproduced on the 2004 map. Was it intentionally omitted? I wondered. Or did it have something to do with changing the gulches? They did not fish for long, and when they were gone, Barbara and I retired to our hammocks for a while, then went for a swim. The water was refreshing and not too cold. After dinner we walked in the meadow downstream from the outlet, but it was too muddy to go very far. That night we slept with tent fly off because it was so warm. Barbara saw a fireball in the eastern sky during the night. Early Thursday morning the group camped above the big meadow packed up and hiked out. We took our time eating breakfast and packing our daypacks. 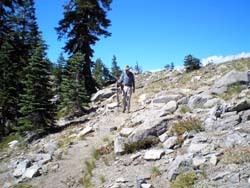 Then we continued eastward on the trail, climbing up toward the ridge that separated us from Trail Gulch Lake. Eight or nine long, steep switchbacks brought us up another thousand feet to the ridge. The hike was through a red-fir forest with lots of shade. Along the way we saw pennyroyal, clarkia, and yarrow, and at the crest a number of bright flowers we could not identify in the exposed, bone-dry gravel. A kestrel perched on the trail flew off toward our meadow far below. On the ridge top we ate lunch and enjoyed magnificent views of Caribou Mountain and Thompson Peak to the southwest and Billy's Peak to the southeast. To the north stood the granitic pyramid of Russian Peak in the Russian Wilderness. After lunch we hiked along the ridge for a while, but in the exposed and shadeless heat, our interest soon boiled off, so we headed back to our own lake. Half-way down the long switchbacks, we heard voices. Horses were approaching from behind us. At the next switchback we stepped off the trail to let them pass. A line of nine equestrians, all middle-aged women, was riding the loop from Trail Gulch to Long Gulch. One by one they coaxed their horses through the tight, steep hairpin turn. At the rear rode a slender soul in a black riding helmet, who looked scared as she tried to bend her steed around the switchback. Perhaps it was a commercial riding outfit, I thought. We found the horses tethered at the horse camp by the outlet stream just below our campsite. Nine horses were tied to the scrawny trees, mauling the soil and blocking the trail with their whinnying and stomping. Barbara and I had to cut wide to avoid entering the danger zone behind the animals' rumps. Several of the women there were sorting through their gear. They had invaded our camp. Three cowgirls stood inspecting the water on the shore beside our fire pit, where our coffee pot still balanced on its grill. Our tent stood nearby, and our backpacks hung from two trees. There was no question that we had occupied the real estate, but to them, it did not matter. They were dressed up like cowgirls in their denim trousers and checkered, pearl-studded shirts, boots, and cowboy hats. "Sorry about cuttin' through your camp," chirped the one with a broad smile and Dolly Parton hairdo. But she didn't appear sorry at all. It was more like, sorry about the human condition, but it just can't be helped. In ones and twos they meandered through the center of our camp and climbed down to the water, as if in the grip of some irresistible summertime compulsion. Laughing and splashing and gabbling loudly, they crowded into the lake for a float. They had each found a bush and changed from their cowgirl outfits into formless one-piece swim suits. Then they blew up inflatable water wings and tubes of garish hues to float and yak in the shallows just off our campsite for an unendurable space of time. Just like little children. As if we were not there and never had been. I was changing my sweaty shirt at my backpack when they began drifting back toward their horses. One woman nearly walked into me, then muttered, "Oh, I guess this isn't the way." I didn't ask whether this was a private group or a commercial enterprise. Either way, they were incredibly pushy, rude, and inconsiderate. While we waited for them to clear out, it occurred to me that there really was no conflict between these riders and the Forest Service policy. The riders simply did not recognize the federal government. These equestrians, like their parents and their parents' parents, had been riding this gulch loop long before the gulches were included in the wilderness, and the "land grab" still didn't sit well. Our campsite was a part of their horse camp, and always had been. This was their way, and it always would be. It was encoded in their genes. By mid-afternoon they were gone. High clouds began to move through, and the wind picked up as Barbara and I went for a swim. Extrapolating from the present horsey trend, I figured that if we stayed one more day, a whole company of local cavalry, jugglers, and clowns would occupy our campsite for most of the next afternoon. Later that day a quiet, older couple with two dogs found a site a few hundred feet west of ours, on the moraine above the lake, which we hadn't seen in our peregrinations. They had come in from Hyampom and were very quiet, the only other people on the lake that evening. We never heard their dogs bark. Friday morning, before leaving, we spoke with the Hyampom couple and they took our photograph. We suggested they relocate to our campsite. As we hiked down the trail, cow bells rang from the upper meadows. Black cows dotted and befouled the meadows and streams. Where the trail cut through a few moist copse of alder and willow we passed tall stands of larkspur and columbine. As I trundled down the steep, rocky trail, paying attention to my footing, my pain, and my breathing, it all became clear to me. As animals shaped by evolution, we are bound to separate things and give them names. Names like hammer. And rock. Like iPad and mint julep and justice. Like nine o'clock and Tuesday. And then we believe that the things we have named are real. How insistent we are that Monday morning should fall precisely seven days after the previous Monday morning. (What if it were really Thursday?) That the 4th of July must be on the 4th day of the month named July. That noon is for lunch. Five-thirty for dinner. Ten o'clock to bed. Peasants in England rioted when the Julian calendar was revised into the Gregorian calendar in 1752. Eleven days were removed between September 2nd and September 14th. "Give us the eleven days back!" they shouted, as if robbed of something material. Even the contemplative monks at Shasta Abbey Buddhist Monastery go about strapped to wrist watches. We insist on the order of the days and the hours and the gulches. How petty! Before we were born and, indeed, after we die, time and space did not, and will no longer, divide itself so. The gulches have no names. Not real names. But then, neither do the days. Nor the hours. Nor the ideas that spindle through our minds like shuttles in a loom. No, we find ourselves adrift in this articulated world, where we confuse all names with the ineffable that lies behind them. At the Trailhead we found only one other vehicle besides our van. As we unloaded the packs, two ladies rode down our trail on horseback and stopped to chat with us. They were camped at the Hidden Horse Campground. When they were gone, we parked the van at a campsite in the shade of the deserted hunters' camp along the creek and ate lunch. The creek, which originated as the outlet stream from our lake, gurgled past, indifferent to whatever it might be called.